England manager Gareth Southgate turned into a style icon for consistently wearing a waistcoat, collared shirt, tie and no jacket. The look was a hit. Marks & Spencer reported a 35 per cent increase in their navy waistcoats during the World Cup. Waistcoats are a versatile, often neglected item of clothing that have a fascinating history. I have been wearing waistcoats since the age of sixteen and don’t plan on stopping. In the year 2000, I was a senior in high school in New Zealand, working part time at a local grocery store and was about to attend my first school ball, the most “important” social occasion of the year. I didn’t care really because I thought the committee of students who organised the school ball were a group of annoying, condescending, know-it-alls. I was excited about getting my first bespoke three piece suit though. I had pages cut out from magazines, and discussed with the tailor exactly what I wanted. Using some of the money I made from my part time job, as well as with a little help from my parents, I was able to get the perfect suit made. The jacket and trousers were a dark charcoal but I decided to do something different by having the waistcoat made in a steel grey. The waistcoat upped the price of my suit but I didn’t care. I had photos of Karl Lagerfeld wearing a waistcoat and it looked cool. Other than him, there wasn’t anyone else who was wearing them. I couldn’t think why though. I’d read up about waistcoats at the local library and found them to be fascinating. Waistcoats came to the western world, specifically through the British monarchy in 1660 from the Persian court of Shah Abbas. It was once suggested to me that the waistcoat may be some form of cultural appropriation. I tend to stay away from this broad type of generalisation, especially when it comes to an item like the waistcoat, that has had a very rich and full history. In any case, it was King Charles II in the 1660s who first started wearing the waistcoat when Persia’s famous ambassador, Sir Robert Shirley, introduced it to the court. In fact, King Charles II proclaimed that the garment should be recognised as proper court attire. How many types of clothing do we know of that were officiated as trendy through what can only be called a fashion declaration by a king? Not too many. Initially, the waistcoat was worn with ornate decorations, embellishments, and in bright colours. Fast forward to the mid-19th century, after the French Revolution, the Industrial Revolution and the rise of dandyism (a love of style and refinement to the point of excess in art, fashion and literature), the look of the waistcoat altered greatly. A more utilitarian look was favoured, and the waistcoat became plainer, more tailored, yet still elegant and often worn with coat and trousers. One could also credit a major change to how the waistcoat was worn to yet another royal. King Edward VII wasn’t only Queen Victoria’s eldest son and successor to the throne, he was also a professional party animal. The man dubbed the Uncle of Europe enjoyed all the pleasures of life: drinking, women, food and fashion. His thoughts and rules about how one should dress were strictly followed, and he expected people who were associated with him to dress as glamorously as he did. King Edward VII also had a rather hefty build. Other than the waistcoat taking a less corseted look, with a straighter line up the torso, King Edward VII wore it with the last button undone. All of this to accommodate his ever-growing belly. Men of the court, no matter their size, followed suit. And even today if one were to wear a waistcoat in a formal setting it would be expected to worn in the Edwardian style, with the last button undone. It could be argued that this is not an iron clad rule these days, but please don’t button up the last button unless you want to look like Steve Urkel (remember the nerdy annoying guy from the ’90s sitcom Family Matters?). In modern times, the waistcoat became an essential part of business men’s attire. But by the mid 20th century, it wasn’t seen as essential. A more relaxed way of men’s formal dressing was adopted. I blame the eighties and the rise of casual sportswear popularised by American designers (particularly sweat pants). Waistcoats were then seen as, not so much eccentric, but European, high end, bohemian, and formal. It is my belief that the waistcoat has taken a special place within men’s fashion, and should be an essential item in every man’s closet. 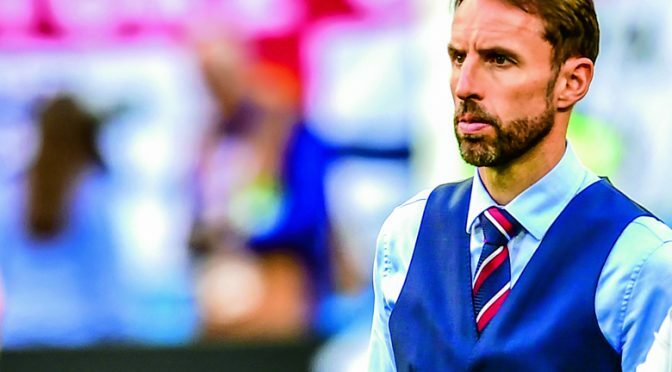 Worn with a three-piece suit, causally with jeans or, as Gareth Southgate has been seen wearing them, without a jacket, today the waistcoat is versatile. I can attest to this. Back to the year 2000, in the last minute (in fact the day before the ball), I and a few friends, decided not to go. In fact, we ditched despite having paid for a ticket. However, I did turn up to the after ball, wearing a pair of dark denim jeans, black lacquered dress shoes, a baby blue t-shirt with an illustration of David Bowie, and my unbuttoned steel grey waistcoat on top. That was eighteen years ago, and I still own that waistcoat. In fact, I’m wearing it right now while writing this story.